The Happy Heart was established over 12 years ago. The store is owned by George Lee and Irene Auyoung. They have expanded and remodeled twice during those years. The large collection of mineral objects in the store are carefully hand-picked for their high energetic qualities from all around the world. George and Irene’s vision of The Happy Heart as an energy store transcends that of a simple rock shop. An aspect of their energy work includes consulting with people to help them perceive and understand their individual emotional, mental, and physical responses to the vibrations of different minerals and stones, and how to use them. They listen and give counsel to what is being asked or sought after. Both Irene and George offer their own specific sensing of energy as they advise in bringing balance and well-being. They offer Feng Shui services in their unique style and assist in using various kinds of stones, quartz, and minerals for balance in the body as well as balance in spaces--home, workplace, business, etc. 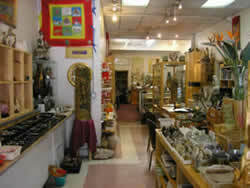 They offer a service of clearing and cleansing space in the home, office, business place, etc. They assist in choosing and using sacred pieces, minerals large and small, and the placement of objects to increase the vibration of the energy field and to create free flow of energy. George and Irene’s network of colleagues allows them to refer clients to other practitioners and energetic workers that relate to the clients’ specific and unique needs. Copyright © 2008 The Happy Heart. All rights reserved.